While looking for a demo of Angry Birds, I notice that Angry Birds for Android are free but alas, I don’t have an Android phone yet. So in the spirit of getting free stuff :) I try to install Android OS on my PC. A lot of tutorial teaches how to install Android on PC but many of them are for developer, take a lot of numerous steps, needs Java to runs or even using live CD. This means, the choice is not for ordinary users who just want to try Android app. 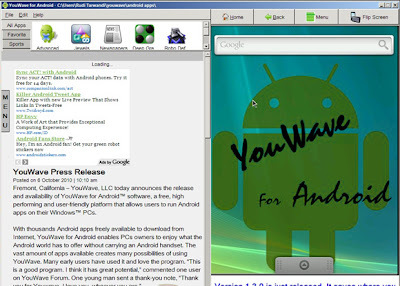 That is where YouWave Android came along. The process is brief; you just download and install the software. It came pre-installed with a couple of apps, a news aggregate app Newspaper, tower defense game Robo Defense free, puzzle like rush hours, Othello, jewels and Advanced Task Killer to easily kill running app. To install Android app are easy, just download from your browser and put it in the default apps directory “<user home directory> /youwave/Android apps/” or any directory of your choice. No direct install from Android market yet so you have to install it manually, there are many places you can download Android app, just Google it using “Android apps” keyword, or you can visit slideme.org or getjar.com to download the apps, Android apps use .apk for its file extensions. The minimum requirements for YouWave Android are Intel 1.6GHz CPU or its equivalent, with 1G of RAM and 500MBytes of free disk space. Internet connections are needed depends on what the apps you are using. 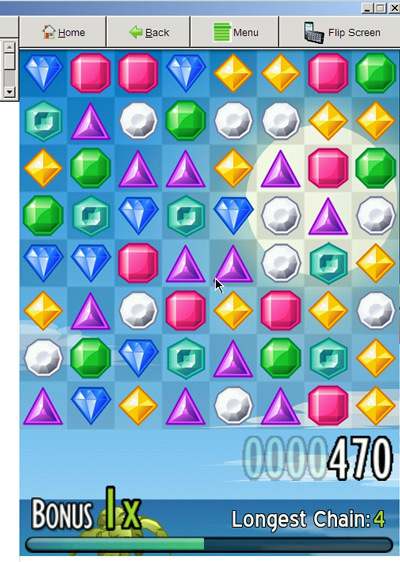 Ads, there is a lots of ads in it, but there is a work way around, just block any connection to the internet. Usually there is a connection each time the software start, you can block those connections using firewall or just turn off the internet connection. Huge resource use, it means it decreases laptop battery fast, my laptop battery usually lasted around 2-3 hours before it needs to be plugged in, with this software, my laptop only lasted 1 hour or so while playing tower of defense game (Xeno Tactic II Lite) (tested on i5). Huge resolutions, this is usually good news but for wide monitor like my laptop and LCD (1366 x 768 pixels) it is bad news, because it uses a really high resolutions for its height and no resize options, that is why I couldn’t took a good screenshot of the software. The means to use the software only trough mouse and keyboards, so no microphone, camera, orientation sensor, SD card support and accelerometer in here yet (tested version 1.31).